The Fourth » Haha, a little girl is really sad! That’s the joke. Haha, a little girl is really sad! That’s the joke. 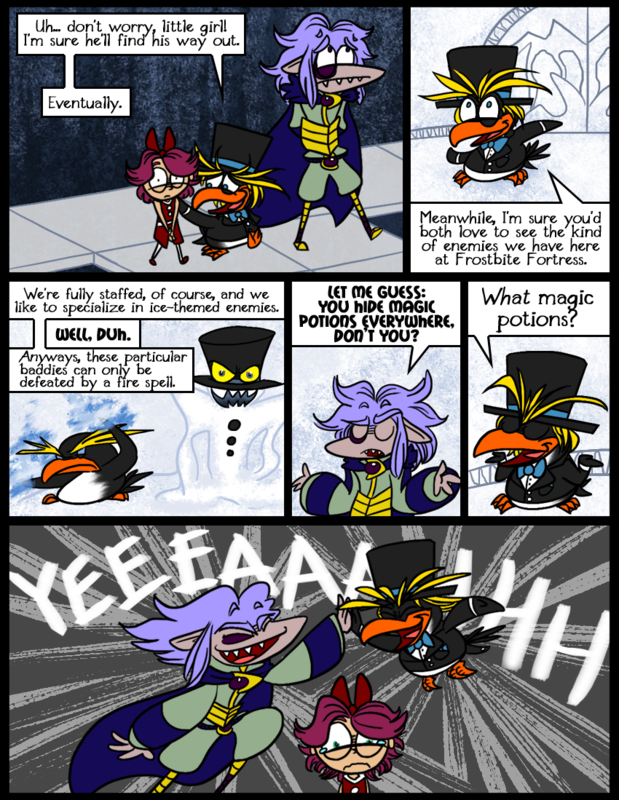 That penguin baddie is just too cool. Actually, the joke is not so much that Lori is sad, as that Skärva is really insensitive and should not be allowed to look after children. This is the first comic without Derk and I am sad too. Speaking of inspirations, I love reading the comic and seeing them everywhere. I’ve noticed DKC, BK, and Paper Mario so far. Really? I don’t deny any of those, but they are often subconscious. What reminds you of each? I imagine Derk playing go-fish with the monsters down there. I actually just petitioned Victor to change this, or something similar, to what actually happens, but alas. yeah im down there too,and were playing snow-fish,we got icecream too,want some?its really really ice and cold! Some might imagine it’s the pits down there, but I hear it’s a maze-ing. I’m sad that Derk isn’t there, too! I’ll admit, though, that penguin sure seems to know his stuff. And Banjo-Kazooie FTW! It makes me happy/terrified to see that snowman again! Me: Argh, everyone thinks it’s the Banjo-Kazooie snowman. Me: NO. They didn’t have eyes on their hats. Victor: So you took something from Banjo-Kazooie and made it more Banjo-Kazooie. Also, before I added the eyes on the hat Victor said “Why did you draw Count Bleck”. I can’t win. Well, it sure reminded me of B-K! Which, for me, is a great thing. …And now that you’ve mentioned Count Bleck, I’m going to have to squint and try to see him, too. It’s the combination of top hat and that mouth. Or the worst. Depends on how you look at it. Either way, I’d love to play through it in a video game. Nah, it’s good to know people still appreciate a challenge. Thanks. I love my Frozio too. I feel like if you hugged him, he would squeak, and then attack you. Oh, not even close. That’s just how awesome this place is. yeah its just awsome,im thinking of buying it back if Skarva doesnt buy it first……which he wont,something horrible is going to happen I just snow it. I will give you all my money for a poster of that last panel. All of it. Haha, we can make that happen. How much all the money are we talking, here? Not much, but it’ll buy you a sammich. what can I get for a few million?cus I have all this cash and nothing to do with it so….